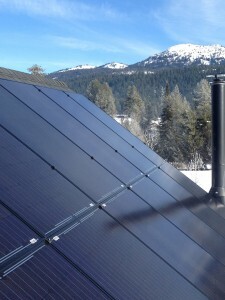 The heart and soul of our Net Zero house is a 6.5 kilowatt photo-voltaic system combined with a solar thermal system. These two power systems combine to provide all the home’s electric and heating needs. The home was actually designed around the 26 panels of the two power systems. The panels are integrated into the roof design and the roof angles maximize solar power and allow for snow shedding. The photo-voltaic system provides electricity for the home and surplus power is sent to the electric car chargers in the garage—it’s a gas station too. The solar thermal panels on the garage provide primary heating for the radiant floors and also provide the domestic hot water. Don’t feel guilty about keeping the heat turned up—it’s all provided by the sun, and the hyper efficient construction keeps the home comfortable on those cold winter nights.